In the first deleted scene we get to see a bit more of just what makes Max (Jaime Fox) so miserable. Within the context of the film, which sees his character become the main villain, the scene caused problems in early tests. We see Max being ignored in his daily life; he’s mistreated and disrespected at work; he has no friends and nobody remembers him. The only person who does remember him is his mother, who also mistreats him and disrespects him. But all this made Jaime Fox’s character too empathetic, and for a movie which was already close to two and a half hours, it made sense to leave the scene out. There were two scenes cut from the film because they were “too scary for kids”. In the first we’re introduced to the mortician who is about to perform an autopsy on Max. This character was all about creating more tension and fun during Electro’s awakening scene. 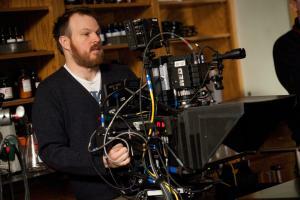 Director Marc Webb liked the last shot in which you see the mortician buried in the wall. It was a nice touch of dark humor that was a little bit too much though for younger audiences. There was a similar scene when Harry Osborne (Dane DeHaan) becomes the Goblin. It was a a werewolf-style transformation that, according to the director, gave nightmares to the children of someone who Webb refuses to name publicly. In the first film, the audience meets Flash, a stereotypical bully who gets Peter Parker (Andrew Garfield) and other students into trouble. Flash adored Spider-Man when he first appeared but in this deleted scene Flash has changed and he’s stopped bullying. During the commentary of this deleted scene, director Marc Webb hints at his possible return: “Who knows? May be we’ll see Flash in other movies”. This is a scene in which Peter visits Harry at the Oscorp building, Peter discovers secret files proving that the company has had him under surveillance. According to Webb’s commentary, “that storyline doesn’t really lead to a whole lot; it just created a certain tension, an idea that Oscorp has been watching Peter”. The filmmakers needed a reason for Peter Parker to come back after Gwen’s death. The reappearance of Peter’s father is a provocative, dangerous scene. It could have been tied together with a little moment from the opening scene that was also cut. During the prologue on the plane, Mary makes Richard promise to get back to Peter the day he needed them. During the tests screens audiences rejected this scene as it felt like a Deux ex machina screenplay trick. Also, it’s Aunt May ‘s job to be the mentor and that’s another reason why the scene was deleted.